My name is Irene and I'm also new in the QP-team! I'm very excited about it, because the products from Pamela are awesome and great to work with! A little bit about myself: I am 37 years old, married with Manfred and we live in the Netherlands. In my free time I almost do nothing else than scrapbooking. I just love her new kit Board Shorts, so I thought it would be a great idea to give away a desktop made with this kit. I hope you like it! I've been married for almost 9 years, and moved with my hubby and 2 cats to Northern California - the bay area, about a year and a half ago. I am in love with Northern California, but miss my family and friends dearly back in San Antonio, Texas (GO SPURS GO!). Though every time I see the Golden Gate Bridge...I am in awe. I hope that never goes away! My screen name on most forums is "kissncontrol". It's one of my favorite songs by A.F.I. Oh and I blog --> HERE. Enough about me! 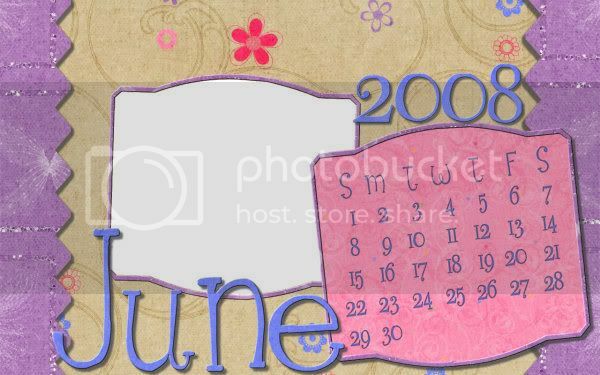 I've created a desktop calendar with Pamela's wonderful Choke Cherry Wine kit! It's available for sale Polka Dot Potato, go pick it up, you'll be glad ya did! Download the desktop --> HERE. There are two - 1 is 1024 x 768, and the other is 1280 x 800. That's all for now! Enjoy!! Pamela has chosen me as one of her new Quick Page Artist's and I am SO HONORED. My name is Heather I go by HeatherStokes or HSDesigns. I am a full time working Mommy of one beautiful blue eyed boy, and happily married wife to my High School Sweeteheart. 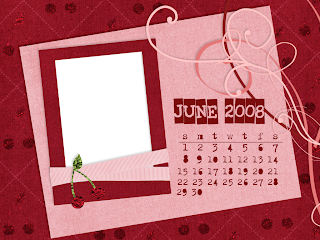 I LOVE to digiscrap, take photographs, and pretty much anything crafty. I am so happy to be a part of the team and look forward to getting to know everyone. Grab the calendar HERE and then run on over to the Polka Dot Potato to pick up thei adorable kit for yourself. I hope you like my first creation for Pamela Gibson Designs. Come on by and visit my blog.....SO HAPPY to be here. Hey there. Maybe I should introduce myself before I start bloggin' around here! My name is Renee and I am the latest Gibson Gal. While I am on the CT and am creative, my gift is with words so I am the writer Gibson Gal. (Actually, one of 3, but I blog a lot too.) You'll meet my kiddoes, Sawyer who is 8 and Bella who's 5 through my layouts as well as my husband, Ryan, and my doggie, Kahlua. I also have a digiscrapblog if you ever wanna check it out. I said I would show off Pamela's new stuff on the blog so here I go. My calendar says May and even in Atlanta, Georgia, it's still not quite time for cherries yet. Wine drinking on the patio, that I can get into! Pamela's aunt and uncle used to make what they called Choke Cherry Wine with Okanogan cherries and bring it down to her when they came to visit. In honor of them, she created the latest addition to the Potato Bar, Choke Cherry Wine. I have my own memories of cherries. I grew up in Michigan and my in-laws live in Traverse City where the National Cherry Festival is held every year when we go visit our family. Cherries grow very well in the special area of Michigan as do grapes so there are many wineries with delicious wines, including cherry wine which we buy by the case before we head back. I was buying 2 cases at 7:30 in the morning one time while my husband loaded the car. I couldn't help but think what the cashier was thinking. I finally told her I have a drinking problem- we can't buy cherry wine in Georgia where I was heading within the hour. I'd love to see how you're using it...post the links! New! Brisk and Boo To You! Finally! Another freebie for you! New products in the store and a little freebie! Finally another freebie QP for you!